And here we are at Day Five of the Week of Happy! Today I wanted to just kinda celebrate my favorite kind of “solid” or “non-solid-solid” as it were. True these are mostly prints, but compared to other prints I use, they are very calm and settling. Particularly Violet Craft’s little birds….I just LOVE these. All of these fabrics are from Michael Miller and the little birds on the right are Violet’s design. The prints above the tiny houndstooth and the large houndstooth on the left are from Patty Sloniger’s line, Emma’s Garden. And of course more treat bags …… I made 100 of these suckers……I wanted to make sure that all of my students at Quilters Affair got a little treat….a thank you from me for selecting my classes. So totally digging this tiny houndstooth as a basic!! So here’s the surprise package (not so much of a surprise now!) that I have been referring to all week as the second prize in the Week of Happy. A whole bunch of stuff from Spring Quilt Market and a few things from the Sisters Outdoor Quilt Show in Sisters, Oregon. So comment about what makes you happy on every day of the Week of Happy and some time on this coming Monday morning, I will pull two winners from all of the comments. One winner for this package and one winner for the Chronicle Books package (read about that prize on Day One of Happy). And again, I have been loving hearing what is making you Happy this week….Helps me to maintain a bit of Happy in my life too!! Ahh I just love these tote bags! Sewing makes me happy! I have been planning to sew two of half-aprons–does it mean I’m making ONE apron? 😉 — for my friends! 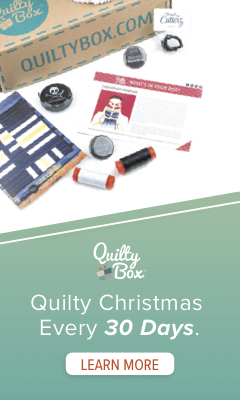 I love that there is such a strong sewing blog community here on the internet! It’s pretty awesome, I can find inspirations and tutorials and tips for projects! Sewing better make me happy today, because my kids are unhappy! Also fabric browsing makes me happy. Thanks!! Your treat bags are so cute especially with the houndstooth fabric. Today what is making me happy is that it is Friday and the start of a beautiful weekend where I have nothing that I have to do and can do what I choose. Color makes me happy…. fabric makes me happy…. sewing makes me happy…. a new grandbaby coming makes me happy… Friday makes me happy!! Surprises, prizes and winning make me happy too! OMG!! 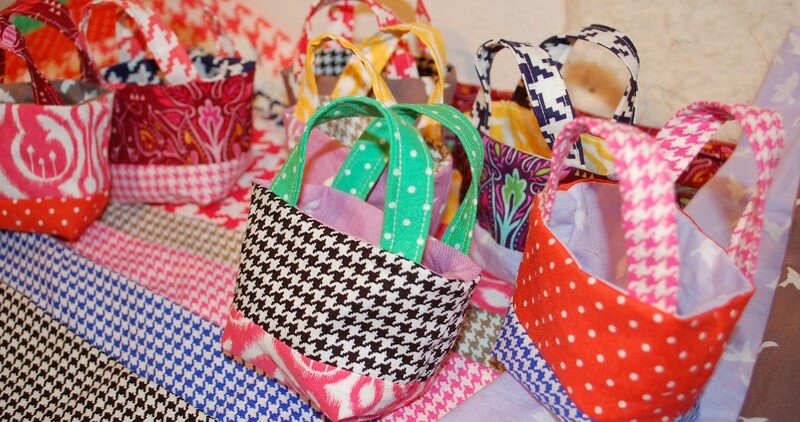 I am loving the hounds tooth fabric and how you made those sweet totes with them!! Today I am happy to have a moment to say, “this is living the dream” when we took a Gondola ride in Venice, Italy!! Amazing and beautiful!! My happy today is flying to Wisconsin for a family reunion. No problems with the flight and we are driving north to Duluth and then to Upson. Making quilt shop stops along the way! You are such a crafty guy and I just love those little gift bags you made up with all of the wonderfully colorful fabrics you used. Not wanting to get too deep about the things that I am most happy for I must say that I am happy that I have an outlet to to express my creative side with crafting and quilting and to pass my love of these crafts on to my granddaughter and my nieces. I am happy to be able to share this creative passion with so many online “friends” who also have similar creative visions. They get me and my love of fabric and my ability to create something wonderful from such raw materials such as pieces of fabric, thread and a sewing machine. I am happy that I have the wisdom not to not sweat the small things but to enjoy my life as a journey and not just a series of destinations. I am glad to be a decidedly happy person. i’m happy to be in the happiest place in the world. no, not disney world, my quilt room. I’m cutting all kinds of squares today. Every time I walk through the laundry room, I stop and cut a few more. Many, many colorful squares to play with makes me happy. Love the houndstooth bags! Having my husband home today after being gone all week makes me happy today! Thanks for all of the happiness this week, it’s been fun. Love the houndstooth fabric! Another happy for me are my 15 grandchildren…only 3 live nearby, so glad for computers that can keep us connected. The fabric really makes cute bags. Your students are going to love them. I have been thinking all day about the things that make me happy. I enjoy the simple things in life. I love sitting on the deck and reading a good book. I love looking at the lake and watching all the new geese, ducks and other birds that visit. I love watching the deer (sorry Scott) that come around in our yard. I love having my grandchildren come over for a visit. But the best thing that makes me happy is sewing. No matter how I feel, I always feel so much better after a day of sewing. Sewing just makes me feel good. Thank you so much for your giveaway and I hope you have a wonderful weekend. I am happy to have family and friends to share my days and like getting homemade gifts from me. Thought of you today when I heard about the Washington wildfires. I’m happy it isn’t near you. Kaffe also makes me very happy. Been playing with some today. Today, I am happy it’s Friday and the start of my vacation! WOO HOO!! Very HAPPY today for simple things that only come around once a year, like fresh off the bush blueberries. So small, so simple, yet so delicious. We drove through an area that is well known for blueberries. We stopped at one little no-name shop along the road and bought a fresh blueberry milkshake. Pleasant to the taste buds and made me smile. The totes are so cute! 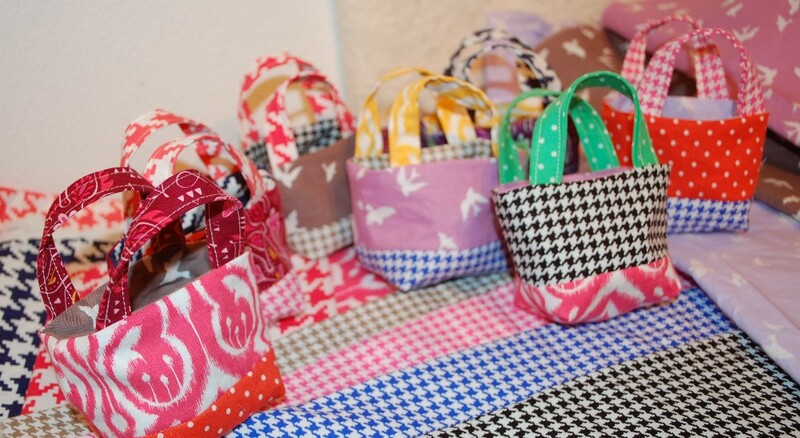 Those little bags with the houndstooth print make me happy; I love them! I was also happy today talking with some friends from church we hadn’t seen for a long time; we went over to their house, then took the kids to the park. A perfect evening of good talk, happy children, tea and ice cream, and a beautiful drive back home with the glowing Minneapolis skyline ahead of us. I have really been enjoying your week of happy too! Thanks for hosting it! I’m happy that I wake up every day with the ability to sit down and work on my creations using beautiful fabrics. I love cutting up fabrics and sewing them together again to make things like bags, quilts, table runners, etc. Spending time with my 93 year old father makes me happy! I’ve spent the morning spinning yarn, that makes me happy and I got given a copy of Diana Gabaldon’s latest which makes me really happy! I am happy that my daughters have such vivid imaginations. They used blankets to create the beach and used stuffed animals for fish and went on a pirate mermaid adventure, they even raided their costumes to have pirate hats and tutu’s for the mermaids. It was so much fun to watch them create a unique world of their own in our living room! 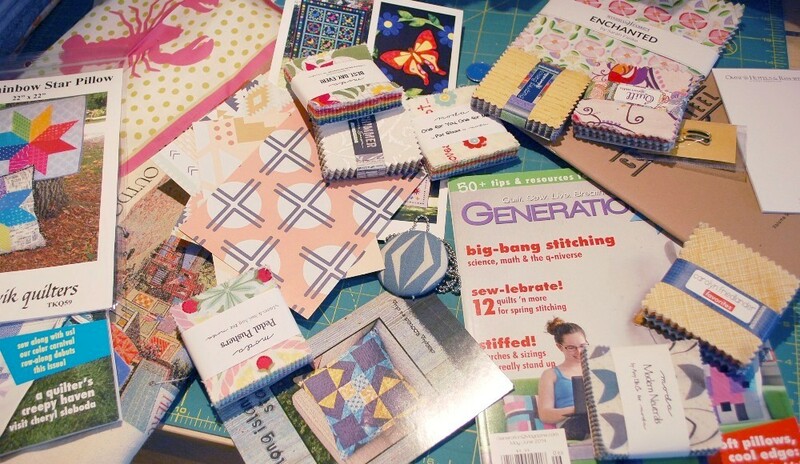 I’m on vacay and have needed to get my sewing fix via bloggers!! Thanks for the chance to win. I am happy everyday just waking up healthy and happy and being able to sew and make quilts. Right now I feel especially blessed to be up in northern Michigan with my whole family plus my mom and cousins and Aunt for our annual reunion on the lake. Been doing this every year of my life. So special and now my grandkids are here too. Four generations! I’m happy that we have such an amazing family. They all came over and spent the entire day helping us get our new house cleaned up and ready for move in. We are so blessed! I’m so happy that my Morning Glories survived a storm, I finished a UFO, and we have left-overs in the fridge so I can sew right up to dinner time! You must be able to make those adorable baskets in your sleep now–lucky students! Today I am happy because I have a whole weekend to sew! Thanks for all the beautiful things that you shared this week! What makes me happy? My teenage daughter showing signs of getting healthier and happier – that is beyond words! 😀 oh and I love me a lot of colourful fabric. My children are all home for the weekend and the house is full of laughter – I’m happy !! A sunny weekend makes me happy – and time to play with fabulous fabric. Love your bags – in so many different fabrics. What made me happy this week was to have the house to myself for three whole days while my husband and daughter were out of town visiting one of his sisters. Heaven! I’m happy that it’s lovely and sunny and I only have 1 week of work before I have a week’s holiday! When I can visit the ocean, blue skies w/white puffy clouds and quilting! I am happy because I commented on all you posts to realize I might be to late but I enjoyed each post. So better late have a happy week! 100!? You are a busy man! Thank you for the fabric love Scott! It was great seeing you and getting to hang out in Sisters and tease you a bit 🙂 See you again soon!